The press is one of the many casualties of Mexico’s ongoing violence, in particular, the local media. Newspapers and TV stations are caught in a battle between censorship, control and threats from the drug cartels, and the local governments. In some cities, people often witness shootings, grenade attacks and other violent events, but when they try to find out what happened, their local news has nothing to offer. Some newspapers have officially announced a policy of self-censorship when it comes to reporting drug war-related news. The result for a lot of Mexicans is that local media is no longer a source of news. Some citizens claim that their local news sources are paid off by the local government in an effort to minimize the violence; others argue that it is the cartels who have bribed them; while others, especially the journalists, say they are being threaten to stay quiet. What is certain is that journalists are being murdered and their murders often go unpunished. Knowing if there is a shooting going on in a certain part a city, is not just about satisfying one’s own curiosity, but about one’s safety. Many of the recent violent episodes in Mexico last long enough that knowing about them can be a life-saving piece of information. Since main stream media no longer fulfill its role of informing citizens about these events, people have turned to social media. Twitter in particular, with its unidirectional follower model and its hashtags, has become one of the main sources of citizen-driven news in Mexico. People often “report”, “confirm” and re-tweet information about violent events using hashtags. In several cities, hashtags have emerged as shared news resources. One of the first cities where these hashtags were used was Reynosa, with #reynosafollow, followed by Monterrey with by #mtyfollow and, more recently, #verfollow for the coastal city of Veracruz. A word count analysis of more than a quarter of a million tweets using the hashtag #mtyfollow over the course of nine months (11/2010 to 8/2011) shows how hashtags are used as a common resource. People hook into the hashtag to “report” (“REPORTAN”, in Spanish), issue warnings (“precaución”, “cuidado”) and request confirmation (“confirmar”) about shootings (“balacera”, “detonaciones” “balazos”) in certain areas of the city (“zona”, “Cumbres”, “Av”, “Sada”). You can also see the popularity of some user handles in the messages. 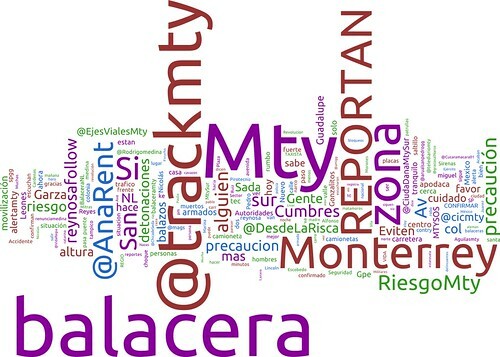 Together, people such as @trackmty, @AnaRent, and @cicmty, have more than 85,000 followers and 65,000 tweets. These people have become reliable information news sources. The message was re-tweeted by twelve people, one of them was @VerFollow, a popular account with more than 5,000 followers that was created to report on the violence in the city. Immediately after these tweets, the rumor started spreading like wild fire. There were reports saying that one the of drug cartels was threatening to kill a child for each cartel member killed. People spread the news via Facebook, emails, and text messages. @gilius_22 reported that the cellphone network went down. Additionally, several other twitter users reported other incidents related to schools and to helicopters supposedly flying at low altitude. By 12:00 pm (only four minutes later) the governor tweeted a message dismissing the rumor. However, by then it was either too late or the governor was not considered a reliable news source (probably a bit of both). Many parents rushed to to pick-up their children from school, causing massive traffic, chaos and panic across the city. Many parents did not take their kids to school the next day and businesses reported a 70% productivity loss due to the incident. Mentions of the hashtag #verfollow in the month of August. 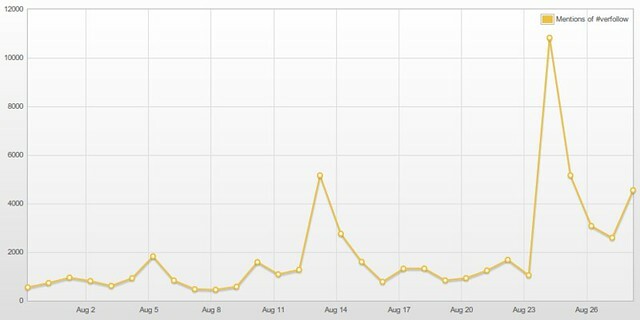 Note the spike in Aug 25, the day of the rumors. Source: Topsy. Wikileaks-inspired logo of the anti-censorship movement in Veracruz. The same day, the government website issued a statement listing sixteen twitter accounts involved in the rumor and threatening to take legal action against them. The statement also mentioned the name of the person associated with the account @gilius_22. By Saturday, @gilius_22 and @maruchibravo were arrested on charges of terrorism. Today, the total number of arrests has increased to three. Some of them have claimed to have been tortured by the police and forced to sign confessions. At the same time, many Twitter users across the country have rallied in opposition to the arrests. Many have mocked the government by calling themselves “twitteroristas”. There is even an Anonymous video “denouncing the government’s reaction against social media and the “lack courage” of the local media to report what is happening in the city. It is unclear what the motives and roles were of those sixteen people charged with spreading the rumor. Did they shout fire because they thought they saw flames or did they completely invent it? What led to the fast viral spread of this rumor? The rumor would not have spread as easily if there was not already a widespread sentiment of vulnerability. It is unclear what did happen that day. There are several reports of military mobilizations around the same time of the tweets. If that was true, it probably added legitimacy to the rumors. Shouting fire in a theater carries a lot more weight that shouting fire in a pool. The rumors spread faster because of a weak information “immune system.” Main stream media and the government are no longer considered reliable information sources in some of these cities. Social media has taken the role of the main stream media and that comes with its own challenges. Social media (i.e. Twitter) has fluid reputation mechanisms, which is positive because it helps protect people’s pseudonymity in light of the real danger faced by journalists. On the other hand, these fluid reputation mechanisms are problematic for assessing the reliability of information. I have never said that in Veracruz ‘nothing happens,’ we are fighting crime with all of our power so we can live in freedom, that is what is happening. The circumstances were fertile ground for spreading misinformation. However, prosecuting Twitter users raises some questions. Yes, their actions caused panic, but does it actually amount to terrorism? Also, it is likely that these arrests will have a chilling effect on social media in Veracruz and maybe other cities, destroying citizen’s last resort for news. Another possible outcome is that social media might be pushed underground, making it even harder to develop reputation-building mechanisms. If you found this interesting, you can follow me on Twitter or identi.ca. Thanks to Nick Diakopolous for his feedback on this post. UPDATE: Related interview on CNN and RWW article.